There are some days when I just have to shake my head and smile at the weird way that things work out. The thing about random loot drops is, obviously, that they are random and impossible to predict. You might go for weeks without getting drop, or get three great pieces in a row. Call it RNG Hell, the Loot Gods, Bad Luck or whatever, but blame random chance for that one item of gear that you've been unable to upgrade. That's where I was last night. My gear was looking pretty good; 522 or better on every single item except for Boots (502 Raid Finder, so at least current tier) and my Shoulders. The shoulders were embarrassing: [White Tiger Mantle], my LFR shoulders from last Tier that stubbornly refused to upgrade themselves. Weekly LFR runs of Iron Qon and Primordius and almost daily Heroic Scenario runs in the hopes that I would beat the miniscule odds and get a 516 drop with stats that weren't entirely useless. Nothing. The Loot Gods were displeased, apparently. I had given up hope completely of ever getting a drop. I was convinced that the drops didn't exist (much like the Shield from Tortos and the Twins, but that's another ranty, Gear QQ post). So I resigned myself to grinding towards Exalted with the Shado-Pan Assault and just buying a set. Finally! I was so excited. I wanted to teleport out immediately and buy them, but my raid leader told me to have some damned patience and wait until the end of the raid. The Loot Gods are bastards, though. After more than two months of waiting and hoping and begging, once I was Exalted and could just buy the damned things and get the suffering over with, what did Primordius drop? Yup: [Spaulders of Primordial Growth]. My raid team all laughed and told me that at least I hadn't spent the money on the reputation gear and would I please finally shut the hell up about shoulders, already? Now, you're probably saying, "So what?" This sort of thing happens to us all at one point or another. Random is random, after all. But the Loot Gods have a real flair for the ironic. Guess what Iron Qon dropped? Yup! [Shoulders of the Crackling Conquerer]. 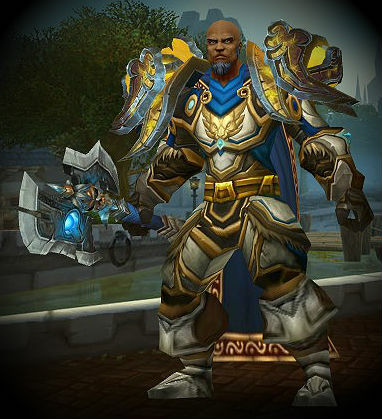 But three sets of shoulders in one night is just too much for any Paladin. Yes, the Loot Gods are a capricious bunch. They will rain Epics of one type and withhold another. For instance, I've had more boots than I know what to do with, but no shoulders. Poor Divacup is a perfect example: She generously gave up Horridon's Last Gasp to me as I was gearing up, and then the Loot Gods punished that act of kindness by ensuring that it NEVER drops when she's in the raid. Oh my goodness! You know what they say.... it comes in threes. Haha! "Loot Gods". I also remember this event when I was still playing.